George Hawley, Ph.D, teaches political science at the University of Houston. A more technical version of this study has been published in the current issue of the academic journal Social Science Quarterly. The Democratic Party enjoys a sizable advantage among Latino voters. It is largely taken for granted that Republicans can earn a greater share of the Latino vote if they support less restrictive immigration policies and legalization for illegal immigrants. This study examines public opinion data from 2006 to consider whether this is the case. The 2006 election is a particularly good year to examine congressional behavior on immigration and the Latino vote because House Republicans passed a strong enforcement bill that year that prompted national protests. They also turned aside efforts to legalize illegal immigrants. This study found that Latinos living in House districts represented by pro-immigration Republican incumbents were no more likely to support that incumbent than Latinos living in House districts represented by Republican incumbents with pro-enforcement records. Supporting more generous immigration policies does not appear to be a way for Republicans to increase their share of the Latino vote. These findings do not mean Republican efforts at outreach to Latinos are misplaced. But embracing a position on immigration similar to that of the Democrats seems unlikely to increase Republicans’ share of the Hispanic vote and is likely to alienate other voters. In the wake of virtually every Republican defeat, a chorus of voices exclaims that the GOP must improve its outreach efforts to minority demographic groups — notably Latinos. Because the Democratic Party has such a lopsided advantage among Latinos and other minority groups, the changing demographics of the United States will presumably doom the Republican Party to permanent minority status. While it is not entirely clear what political strategy will boost the GOP’s fortunes among the important and growing Latino electorate, it is frequently argued that Latinos will be much more receptive to the Republican Party if it abandons its hard-line stance on illegal immigration. While it is intuitively appealing, this argument is largely taken on faith. There is little empirical evidence suggesting a majority of Latinos support the Democratic Party because of the immigration issue. This study tests the hypothesis that pro-immigration Republicans enjoy more success among Latinos. It finds no evidence that Republican members of Congress who support less restrictive immigration policies receive higher levels of Latino support. In the wake of the Republican Party’s resounding defeat in the 2012 presidential election, combined with losses in the House of Representatives and the U.S. Senate, the GOP should certainly engage in serious soul-searching to determine why its message is failing to resonate with a growing percentage of the electorate. Those who argue that immigration reform could be a critical Republican “parachute” do get one thing correct: part of the Republican Party’s problem can be traced to demographics. Although the Republican Party continues to perform well among non-Hispanic white Americans, it consistently loses among African Americans, Asian Americans, and Latinos by overwhelming majorities. This is particularly problematic for the Republicans because the non-Hispanic white percentage of the electorate is shrinking. In response to its electoral difficulties, it is typically argued that the Republican Party must chip away at the Democratic advantage among minority voters and must focus particularly on Latino voters who represent a large and growing percentage of the overall electorate. 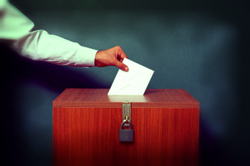 It is common to hear Latinos described as “swing voters” whose support is always up for grabs. Many activists and analysts, both liberal and conservative, have suggested the Republican Party can boost its image among Latino and other minority voters by embracing immigration reform — specifically, by pursuing policies that offer a pathway to citizenship to illegal immigrants. This ballot initiative, as well as subsequent restrictionist initiatives such as Proposition 209, likely benefited the California Republican Party in the short term. According to some analysts, however, good short-term politics was disastrous for the California GOP in the long-term. 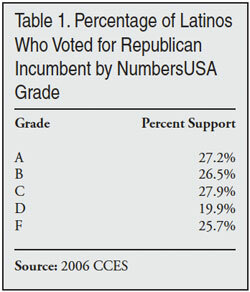 It has been often argued that the Republican Party’s reputation for nativism ultimately drove large numbers of California Hispanics to the Democratic Party3 and encouraged them to vote in greater numbers.4 Because Latinos are such a large percentage of the California electorate, their lopsided support for Democrats ultimately made the Republican Party uncompetitive in state-level elections. The presumed lesson of Propositions 187 and 209 is that any short-term gains Republicans enjoy as a result of an aggressive anti-immigration position will be overruled by a corresponding long-term drop in support from Latinos. These arguments are intuitively appealing and are apparently based on sound reasoning. After all, there is compelling evidence that large majorities of Latinos oppose immigration restriction tactics such as workplace raids and the criminal prosecution of illegal immigrants and their employers.7 Thus, a Republican who pursues such policies will be at odds with a majority of his or her Latino constituents. That said, the argument that “comprehensive immigration reform” will lead to a substantial increase in Latino votes for Republicans may not be as strong as it first appears. If we wish to predict how Latino voters respond to amnesty for illegal immigrants, we can look to recent political history. It is often forgotten that amnesty was given to a large percentage of illegal immigrants in the 1980s. In 1986, President Reagan signed the Immigration Reform and Control Act (IRCA). This law legalized illegal immigrants who had lived in the United States since 1982. Based on the logic of current amnesty proponents, this bill’s passage should have led to an avalanche of Latino votes for Republican candidates. In truth, the Republican Party lost Latino support from 1984 to 1988 in presidential elections.8 The Republican Party also subsequently lost control of the U.S. Senate to the Democrats shortly after passing this law. There is no evidence that the GOP experienced an electoral benefit from the previous amnesty of illegal immigrants. There is furthermore little evidence that Latinos are “swing voters”, despite the fact they are often characterized as such by the media.9 Strong majorities of Latinos have supported Democratic presidential candidates in all presidential elections in recent memory. John McCain, who was perhaps the most vocal Republican supporter of amnesty and “comprehensive immigration reform” in the Senate, earned the votes of only 31 percent of Latinos in his 2008 bid for the presidency. For all of these reasons, it seems unlikely that by switching positions on immigration a Republican member of Congress could capture a substantially greater share of the Latino vote in his or her district. There is another question that must be considered by Republican legislators interested in pursuing Latino voters via immigration policy: How will non-Latino voters respond to Republican incumbents who support amnesty for illegal immigrants? While it is not implausible to hypothesize that Latino voters are, on average, much more sensitive to the immigration issue than other voters, it should not be taken for granted that voters who oppose amnesty will not punish incumbents who support such a policy. While non-Hispanic white voters may not, on average, feel as strongly about immigration policy as Latino voters, there are far more of them, they have higher voter turnout rates, and large majorities of them have strong negative feelings toward illegal immigration.10 At least from an electoral politics standpoint, Republican incumbents should only embrace expansionist immigration reform as a strategy to court Latino voters if they are confident that such a strategy will not provoke a backlash from other demographic groups. To this point, no one has definitively demonstrated that voters of any demographic background are more or less likely to support Republican incumbents with a record of supporting expansionist immigration policies. This study attempts to fill this gap. Specifically, it considers whether Latinos really are more likely to vote for Republican House incumbents with pro-immigration records and whether non-Hispanic white voters are less likely to support such incumbents. Based on an analysis of public opinion data from 2006, a year in which immigration was a particularly salient issue, this study finds no evidence that a pro-immigration Republicans enjoyed more Latino support than their restrictionist colleagues. Furthermore, pro-immigration Republicans may have actually lost support among non-Hispanic white voters as a result of their immigration records. While Republican incumbents may have any number of justifications for supporting immigration reforms that provide a pathway to citizenship, they should not expect such policies to be an electoral panacea. 2006 was chosen as the best year to consider the relationship between congressional behavior on immigration and Latino vote choice. This was a year in which immigration was a particularly salient issue. The 2006 elections occurred at the end of the 109th Congress. It was during this Congress that both the House and the Senate considered controversial immigration bills. The House passed the Border Protection, Anti-Terrorism, and Illegal Immigration Control Act of 2005 (H.R. 4437), which was a highly restrictive immigration bill that made it a felony to assist illegal immigrants and included no provisions for a pathway to citizenship. The Senate passed the Comprehensive Immigration Reform Act of 2006 (S. 2611), which did provide a pathway to citizenship for illegal immigrants. In response to H.R. 4437, there were widespread protests across America by pro-immigrant activists. This led to a series of counter-protests by those who opposed illegal immigration and a pathway to citizenship. In total, protests occurred in more than 100 cities. These protests received widespread media coverage and immigration was one of the most discussed policy issues leading up to the 2006 midterm elections. Given the degree to which immigration was a high-profile issue in 2006, this year represents the most recent election year in which there was the greatest chance of uncovering a relationship between congressional behavior on immigration and vote choice in the electorate. To consider this question, a dataset that included respondent ethnicity, respondent vote choice, and respondent congressional district was necessary. This study relied on the 2006 Cooperative Congressional Election Study (CCES)11 to examine vote choice among Latinos and non-Hispanic whites. The CCES was the result of telephone interviews of 36,500 randomly selected adults. The survey asked respondents questions regarding their vote choice in the midterm congressional elections as well as their positions on a number of major policy issues, including immigration policy. These respondents were then coded according to their congressional district. Because this study is specifically interested in whether Republican members of congress can boost their share of the Latino vote by changing their positions on immigration, the examination of the CCES data was restricted to those respondents living in districts with a Republican incumbent who did not retire at the end the 109th Congress — that is, they stood for reelection that year. Of the survey’s respondents, 1,550 were Latinos living in such districts. 14,378 were non-Hispanic whites living in such districts. To determine whether there is a relationship between vote choice and incumbent immigration records, some measure of congressional behavior on immigration was necessary. NumbersUSA is the most reliable source of information on congressional behavior regarding immigration. NumbersUSA is an organization dedicated to restricting immigration levels in the United States. This organization creates “report cards” for every member of congress based on how their actions in Congress influence the nation’s overall immigration level. These report cards are based on members’ floor votes, their committee votes, and their bill co-sponsorships. Grades can range from an A+ to an F-. Those members with a highly restrictionist record have better grades, whereas those with expansionist records have lower grades. This is not what we find. 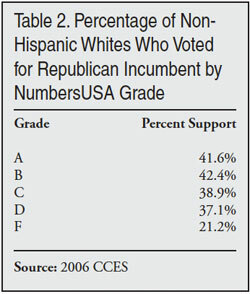 Among Latino respondents, those in a district with an anti-immigration Republican incumbent did not appear any less likely to claim they voted for that incumbent rather than the Democratic candidate, some other candidate, or did not vote.12 This seems to indicate that those pro-immigration Republicans did not enjoy any electoral dividends among Latino voters as a result of their immigration record. That being said, this at least does not indicate that Republican legislators lose votes as a result of their immigration record. Here we see a more obvious relationship. A smaller percentage of non-Hispanic whites living in districts with a Republican incumbent with a lower grade from NumbersUSA voted for that incumbent rather than the Democratic challenger or did not vote at all than non-Hispanic whites living in districts with a Republican incumbent with a more restrictive record. Great caution should be exercised when interpreting these findings because some grade categories had a relatively small number of observations. For example, the number of Republican incumbents who earned an F was quite small, and they were furthermore in districts with a smaller-than-average percentage of non-Hispanic whites. Thus, the total number of white respondents in these categories was also small. 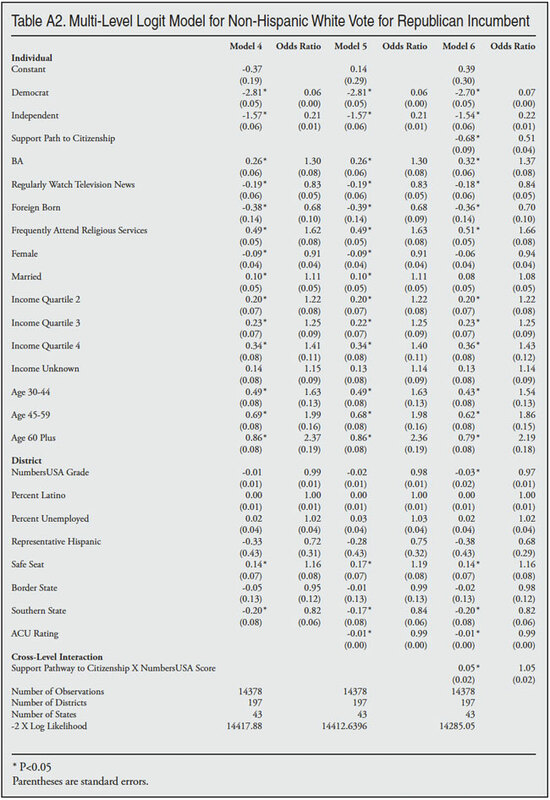 These simple descriptive statistics indicate that Republicans see no benefit among Latino voters when they cultivate a pro-immigration record, but they do perform less well among non-Hispanic white voters. Of course, any apparent causal relationship discerned from these descriptive statistics may be spurious. To better determine whether or not vote choice is determined by incumbent immigration records, a more sophisticated statistical analysis is necessary. The dependent variable in these models was respondent vote choice. The key independent variable was incumbents’ NumbersUSA grade, transformed from a categorical variable to a continuous variable ranging from 0 (an A+ from NumbersUSA) to 13 (equivalent to an F- from NumbersUSA). In all models, it was necessary to include a large number of individual and contextual variables. Of the individual-level characteristics, it was necessary to control for the political party the respondent identified with, as party identification has long been one of the most important determinants of vote choice and is stable across time for most voters. This was treated as three dichotomous variables (Republican, Independent, and Democrat), with Republican serving as the base category. One plan considered by the Senate would offer illegal immigrants who already live in the U.S. more opportunities to become legal citizens. Some politicians argue that people who have worked hard in jobs that the economy depends should be offered the chance to live here legally. Other politicians argue that the plan is an amnesty that rewards people who have broken the law. What do you think? If you were faced with this decision, would you vote for or against this proposal? The respondents’ answer to this question was included as an independent variable. It was also interacted with incumbent immigration records. There are obviously other incumbent and district attributes beyond immigration records that determine vote choice. Some measure of a race’s competitiveness was important to include. To measure this, the ranking of a particular race by Congressional Quarterly in the months leading up to the election was included — those classified as “safe” were classified as 1 and all other races were classified as zero. The overall conservatism of a member — measured by using scores from the American Conservative Union — were also included, as was whether or not the incumbent was Hispanic. District characteristics, such as whether or not the district was in a border state, whether or not the district was in the South, the district unemployment rate, and the percentage of the district that identified as Latino were also included in these models. The tables that include all of the multilevel models used to examine the relationship between incumbent immigration record and individual vote choice for Latinos and non-Hispanic whites can be found in Tables A1 and A2. These models were congruent with the descriptive statistics presented earlier. After controlling for all other variables, there was no evidence indicating that Latino respondents were more likely to support Republican incumbents with liberal records on immigration. In all cases, the coefficient for NumbersUSA grade failed to achieve statistical significance. In fact, the coefficient was not even in the expected direction — these coefficients indicate that Latino respondents were less likely to support incumbents with liberal immigration records. There was furthermore no evidence of an interactive relationship between individual attitudes on immigration and incumbent immigration record on vote choice. The results for non-Hispanic whites were somewhat more complicated. These results do indicate that non-Hispanic white voters were sensitive to incumbent voting record when determining vote choice in 2006. However, in this case the interactive term was statistically significant. Non-Hispanic whites who opposed a pathway to citizenship were less likely to support incumbents with liberal immigration records. Non-Hispanic whites who supported this policy were more likely to support such incumbents. This makes it more difficult to determine precisely how immigration records will influence aggregate vote choice among non-Hispanic whites. However, it is important to note that, among non-Hispanic whites, particularly among those living in Republican congressional districts, the percentage that opposes a pathway to citizenship for illegal immigrants dwarfs the percentage that supports this policy. While the argument that Republican incumbents can boost their share of the vote among Latinos by embracing liberal immigration policies seems plausible, it is not backed up by any empirical evidence. The analysis presented here found no relationship between Republican immigration records and the vote choice of Latinos living in Republican districts. Whether a Republican member of Congress was a strong liberal or a strong conservative on immigration, most Latinos living in Republican districts did not vote for the incumbent in 2006. Thus, Republicans who take a more liberal stance on immigration should not expect to see a corresponding increase in their share of the Latino vote. Although there was no evidence that Latinos were sensitive to incumbent immigration records when determining vote choice in 2006, there was modest evidence that non-Hispanic whites were more likely to vote for incumbents whose immigration records were congruent with their own attitudes. Because strong majorities of white voters have negative feelings toward illegal immigrants and oppose amnesty,14 pursuing expansionist immigration policies will likely cost Republican incumbents more votes than they gain. This is not to say that the Republican Party cannot make inroads among Latino voters. However, these results do not indicate that liberal immigration policies are an effective means to pursue this goal. In fact, given the risk of a backlash from non-Hispanic white voters who oppose liberal immigration policies, support for expansionist policies such as amnesty for illegal immigrants will likely lead to a net loss of votes for Republican incumbents. 1 Brian Bennett and Lisa Mascaro, “Some Republicans Call on Party to Embrace Immigration Reform”, Los Angeles Times, November 17, 2012. 2 Adrian D. Pantoja and Gary M. Segura, “Fear and Loathing in California: Contextual Threat and Political Sophistication Among Latino Voters”, Political Behavior 25(3):265–86, 2003. 3 Gary M. Segura, Dennis Falcon, and Harry Pachon, “Dynamics of Latino Partisanship in California: Immigration, Issue Salience, and Their Implications”, Harvard Journal of Hispanic Politics 10:62–80, 1997. 4 Matt A. Barreto and Nathan D. Woods, Voting Patterns and the Dramatic Growth of the Latino Electorate in Los Angeles County, 1994–1998. Claremont, Calif.: Tomas Rivera Policy Institute, 2000. 5 Grover Norquist, Leave Us Alone: Getting the Government’s Hands off Our Money, Our Guns, Our Lives, New York: HarperCollins, 2008. 7 David L Leal, Stephen A. Nuno, Jongho Lee, and Rodolfo O. de la Garza. “Latinos, Immigration, and the 2006 Midterm Elections”, PS: Political Science and Politics 41(2):309–17, 2008. 8 Ronald W. Mortensen, “Hispanics were Democrats Long before Illegal Immigration Became an Issue”, Center for Immigration Studies, November 8, 2012. (Retrieved January 7, 2013). 9 David L. Leal, Stephen A. Nuno, Jongho Lee, and Rodolfo O. de la Garza, “Latinos, Immigration, and the 2006 Midterm Elections”, PS: Political Science and Politics 41(2):309–17, 2008. 10 Public opinion surveys consistently show Americans have negative opinions toward illegal immigration. For example see Thomas J. Espenshade and Katherine Hempstead, “Contemporary American Attitudes Toward U.S. Immigration”, International Migration Review 30(2):535–70, 1996. For more recent findings, see Peter H. Schuck, “The Disconnect Between Public Attitudes and Policy Outcomes in Immigration”, pp. 17–31 in Carol Swain, ed., Debating Immigration. Cambridge: Cambridge University Press, 2007. 11 Stephen Ansolabehere, Cooperative Congressional Election Study Common Content, 2006. 12 It is important to note that respondents to these kinds of surveys tend to over-report; that is, they claim to have voted when they did not. Although there is little reason to believe this introduced bias into these results, we cannot be certain that every respondent voted as they claimed. For a more thorough discussion on this subject, see Carol Cassel, “Overreporting and Electoral Participation Research”, American Politics Research, 31(1): 81-92, 2003. 13 For a thorough explanation of multilevel models and when they are necessary, see Marco R. Steenbergen and Bradford S. Jones, “Modeling Multilevel Data Structures”, American Journal of Political Science 46:218–37, 2002. 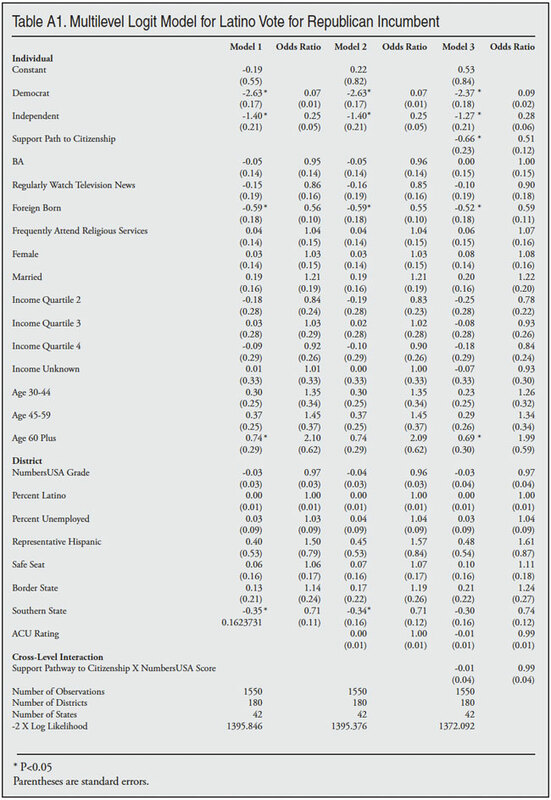 14 The Federation for American Immigration Reform provides a roundup of polling data on amnesty and illegal immigration. (Retrieved January 8, 2013).